You’re busy. Very busy. The last thing that you have time to do, as a busy mechanical engineer, is work on your LinkedIn profile, right? Well, I want you to know, time spent on improving your LinkedIn profile is well worth it. How do I know this? I am a licensed professional engineer and a career coach, specifically for engineers, and over the past few years, I have written a bestselling book called Engineer Your Own Success, given a TEDx talk for engineers, and created The Engineering Career Coach podcast which has been downloaded over 1 million times. The point is, I have had a lot of interaction with engineers trying to advance their careers, and LinkedIn is one avenue that is very powerful, but extremely under-utilized. 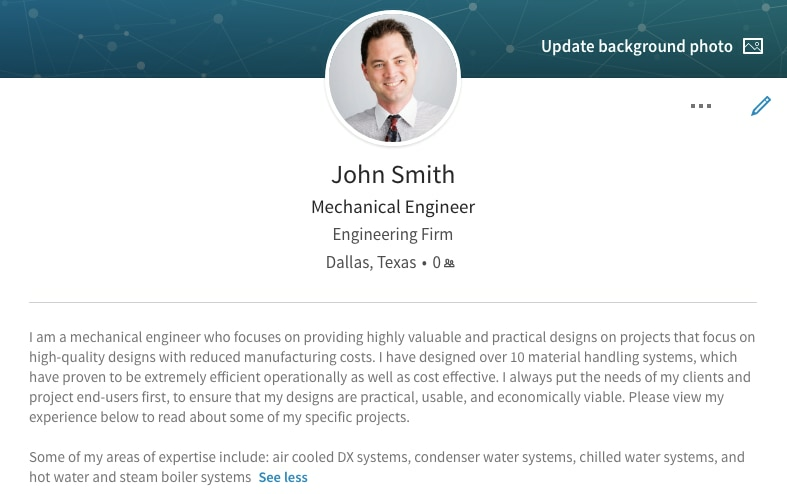 Most of the engineers that I have worked with over the years have average or below average LinkedIn profiles, which is a shame, because your profile is such an easy way to stand out as an engineer if it is built correctly. Therefore, my goal with this article is to provide you with 5 steps that you can take to drastically improve your LinkedIn profile. Keeping in mind that you are very busy, you should be able to accomplish all of these Linked tips in less than 60 minutes. Considering the results that these improvements can garner, it will be well worth one hour of your valuable time. Before I dive into these 5 simple steps, let me dispel one big misnomer that exists among engineering professionals about LinkedIn. LinkedIn is not something that you should use only when you are looking for a new job. Your LinkedIn profile is your online business card. People are most likely looking at yours every day. It should be professional and engaging, and if set up the right way, it can help you build an extremely deep and rich network of engineering professionals, that can yield various opportunities for years to come. Lastly, I do as I say, so when taking the following steps to supercharge your LinkedIn profile, feel free to look at my profile, follow my lead, and connect with me. Step #1 – Review the basics. The steps in this article, while they can be done relatively quickly, are beyond the basics of LinkedIn. That being said, in this first step, I want to review a few basic items. Please add a professional photo to your LinkedIn profile, right now. Literally, stop what you are doing, and take this step, or at least start the process. When I say a professional photo, I mean, put on some professional attire, go to a photographer, and have professional headshots taken for your profile. This is the first thing that people look at when they land on your LinkedIn profile. This photo is what they will use to create an instant judgment about you, which I know sounds ridiculous, but it’s true. Secondly, add more people to your LinkedIn network. Your connections play a role in your LinkedIn search ranking. Therefore, to increase your visibility, you should always be building your network. Take a minute to connect with some people that LinkedIn is recommending for you, or people that you may have met recently. Try to add 10 people to your network today. Step #2 - Write an engaging, keyword rich summary. The keywords in your LinkedIn profile play a huge part in whether or not anyone finds your profile. Recruiters spend a lot of time searching for candidates on LinkedIn using very specific keywords. For example, you might include the CAD software you use in your profile (Autodesk Inventor or SOLIDWORKS). You might also include your industry segment (i.e. material handling). When people land on your LinkedIn profile, in most cases, the first and sometimes only thing they will read is your summary. It’s clear to me that most mechanical engineers don’t consider these two items, so if you do, you will likely stand out in your field. Your summary needs to absolutely grab people, and make them either want to read more, or ideally connect with you. To keep this article in line with my goal of allowing you to take action quickly, here’s a sample. Oh, and please, write in first person, unless you are the President of the United States, I think your profile should read like it comes right out of your mouth. It may be helpful to draft your summary in a Microsoft Word document and have someone else review it prior to publishing it on LinkedIn. I recommend keeping the summary to one or two paragraphs and no more than 250 words. The goal of the summary is to be short, focus on how you provide value to people as opposed to simply telling them all of the great things about you, and to include some keywords for when someone is doing a LinkedIn search. Step #3 - Change your job descriptions to bullets. In case you haven’t noticed, people don’t have time to read much these days, which is exactly why I have included a video at the top of this article. That being said, I urge you to make sure that all of your different employment positions on your LinkedIn profile contain bullets, to make them easy to scan through. I recommend no more than 5 bullets per position to make each position easy to scan. Operate, maintain, and make repairs to generators and motors, feed and vacuum pumps, feed conveyors, blowers. Install, maintain, and repair a variety of production and maintenance machines, equipment, power tools, and special purpose equipment. Perform maintenance welding to install, alter or repair machinery and other plant equipment in accordance with regulatory standards. Maintain piping systems including sprinklers, low-pressure steam heating, compressed air unit, water, and gas system, etc. Step #4 - Ask for 3 recommendations on your terms. LinkedIn recommendations are important for two reasons. Firstly, the number of recommendations affects your LinkedIn profile strength. Secondly, recommendations can really boost your credibility. Here’s where most people go wrong when requesting a recommendation. 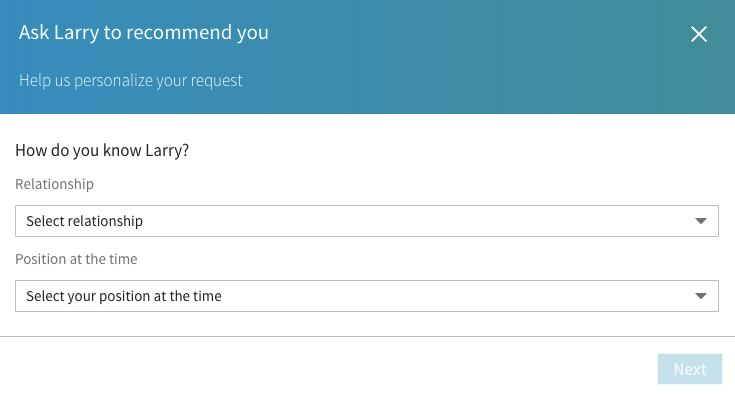 They use the standard LinkedIn request message, which reads something like this: I'm writing to ask if you would write a brief recommendation of my work that I can include on my LinkedIn profile. If you have any questions, please let me know. I enjoyed working on XYZ project with you. Could you please write me a LinkedIn recommendation explaining the value that you thought I brought to the project? Using this framework will make it easier for people to recommend you and the recommendations will be pointed and powerful. Step #5 - Add skills and endorsements. There is a section on your LinkedIn profile called Skills, where you can specify certain skills that fall under your area of expertise. This feature is relatively new compared to most other LinkedIn features and most professionals still don’t use it as they should. This feature allows you to list certain skills in which you exhibit strength. For example: AutoCAD, HVAC, MEP, Energy Efficiency. One benefit of the skills section is that it allows people to easily endorse you for a certain skill without having to take the time to write a lengthy recommendation. Another benefit of endorsements is that, while LinkedIn hasn’t said this, many experts believe that the more endorsements you have, the higher you will be listed in search results on LinkedIn for that skill. Lastly you are able to hide endorsements as needed, should someone endorse you for something that you feel is not one of your areas of expertise. All right, there you have it. A simple plan that you can follow to supercharge your LinkedIn profile. If you like it, and want to implement it, simply watch the video at the top of this article and follow along, making the changes on your LinkedIn profile. I am a huge believer in the Pareto Principle, also known as the 80/20 rule, which essentially promotes focusing only on the 20% of actions that will yield 80% of the results in your career. Therefore these 5 steps will address the most prominent and impactful sections of your LinkedIn profile, and again, you can drastically improve most of them in approximately 60 minutes, with the exception of getting a professional photo. Bonus Step - Publish LinkedIn posts. Another very prominent section of your LinkedIn profile is LinkedIn posts, which appears close to the top of your profile. This is where you can publish your own articles right on your LinkedIn profile. A good way to use this as a mechanical engineer is to write two or three posts that provide case studies of recent projects you have worked on. Try to include photos, and any statistics such as the benefits realized by the end user and/or your client and employer. 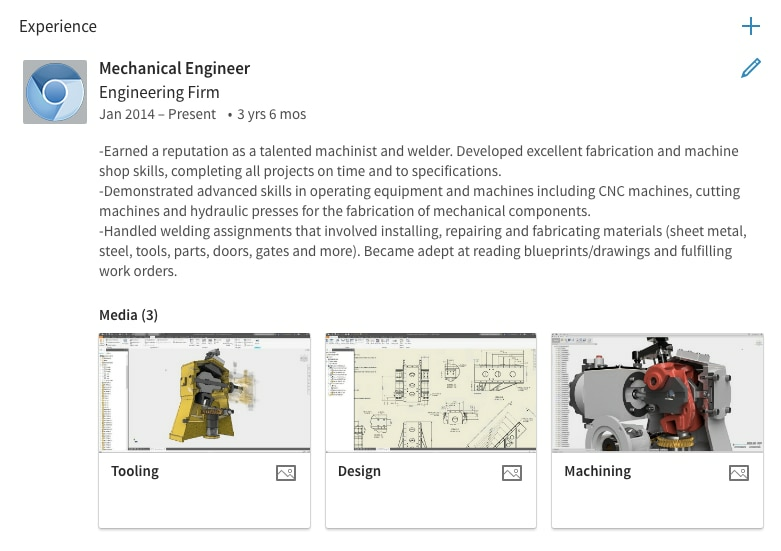 These posts can really boost your credibility, and add a dynamic dimension to your LinkedIn profile, one that most mechanical engineers don’t posses. Anthony Fasano, P.E. is an engineer turned professional development expert. He has written a bestselling book entitled Engineer Your Own Success: 7 Key Elements for Creating an Extraordinary Engineering Career. He has coached hundreds of engineers on their career development, through his website: The Engineering Career Coach which is loaded with free career resources for engineers including two top rated iTunes podcasts that have been downloaded over 1.5 million times. His goal is to help engineers create extraordinary careers and lives. You can view all of his work at www.EngineeringCareerCoach.com.